Abu Dhabi is the federal capital of the United Arab Emirates and the largest of the 7 emirates, occupying more than 80% of the country’s total land. There are several free zones in Abu Dhabi, which offer a favorable environment for business setup in the Emirates and provide a gateway for foreign investors to tap its full potential. Abu Dhabi free zones are a part of the Emirate’s economic diversification initiative to boost the local economy and promote foreign investment. Business setup in free zones comprises primarily media and light companies, logistics companies, and medium & heavy industries. There are many incentives and facilities that shareholders receive by setting up a company in Abu Dhabi free zones, which is the key driving force behind company formation in Abu Dhabi. A Limited Liability Company (LLC) is an independent legal entity, with individual shareholder(s), corporate shareholder(s), or a mixture of both. The minimum capital requirement depends on the type of business activity. With the exception of foreign companies licensed to operate from a free zone in the UAE, a foreign company may carry on its main activity or business in the UAE or establish an office or branch after a license is issued by the Ministry of Economy and Commerce. A company set up in the UAE can also open a branch in free zones, mainland or offshore. Freelancers are granted a freelance permit, which identifies one as a sole practitioner and enables him/her to conduct a business in one’s birth name, as opposed to a brand name. How to Set Up Your Business in Abu Dhabi Free Zones? The government promotes company formation in Abu Dhabi free zones to facilitate and promote foreign investment, therefore the procedure for business setup is simple, straightforward, less time-consuming, and free from bureaucratic barriers. Free zones are established as independent jurisdictions which act as a single-window administration and allow an expatriate entrepreneur to wholly own a company (100% shares), without partnering with a UAE national. 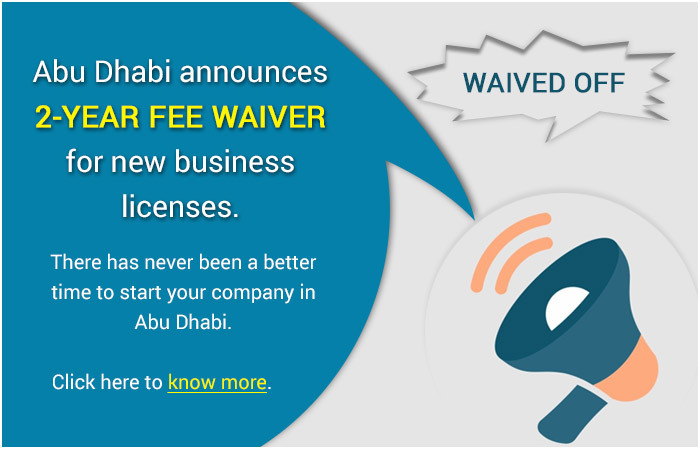 Abu Dhabi Free Zone Authority (FZA) is the independent government body that issues free zone operating licenses, handles registration of non-resident companies, and provides assistance to companies in establishing their business. Since each business activity has its own rules and regulations, you are required to determine the activity that you are going to conduct, and then go forward with it. After you are through with the first step, the next one is to register the trade name of your company. You can give the list of your suggested names to the Abu Dhabi Free Zone Authority, and if the name is not already registered by the existing company in the UAE, it shall be approved by the authorities and duly registered. After getting initial approval for your trade name and fulfilling all the requirements, an investor must obtain approval for issuance of the business license. Once the approval of the concerned authorities is obtained, the investor may proceed to the stage of fulfilling the legal requirements of business license issuance from the free zone authority. There are a few free zones where a copy of the proper business plan is also required. Why Set Up a Business in Abu Dhabi Free Zone? With the global trend of trade liberalization, Abu Dhabi Free Zone Authority is keen to cash in on various opportunities and challenges, providing tremendous support to companies established within its free zones. Company formation in Abu Dhabi free zones needs comprehensive business planning and decision making to ensure that appropriate infrastructure is chosen and all the necessary formalities are taken care of. One should be aware of all the legal procedures, licensing and registration requirements, types of ownership possible, funding requirements and have each and every document in place along with the minimum capital amount to be deposited in the bank as per the selected free zone. Commitbiz has a specialized team of professionals with extensive knowledge of all company formation rules and regulations in Abu Dhabi free zones and can help you with company formation Abu Dhabi in the commercial zone with ease, and ensure huge tax savings. We help you form your company in the appropriate free zone by taking care of the visa, banking, licensing, registration, residential, and recruitment prerequisites. We understand your company formation dreams in the Emirates and strive to fulfill those with complete gusto. Contact us for company formation in Abu Dhabi free zone, and our business consultants will assist you at the earliest.